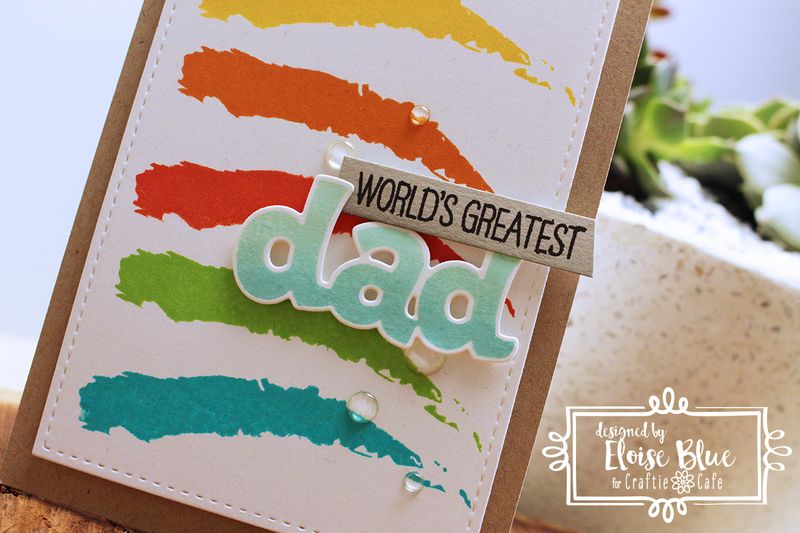 Hi everyone, today I'm here for Craftie Cafe and today I have another Father’s Day card for you all using a WPlus9 stamp set called Epic Dad along with some Lawn Fawn inks to create a simple design that can be used for so many different occasions. To begin my card I first took a stitched rectangle die and cut it out of some white cardstock. I then took several colours of Lawn Fawn Inks that would coordinate well together and could begin stamping. 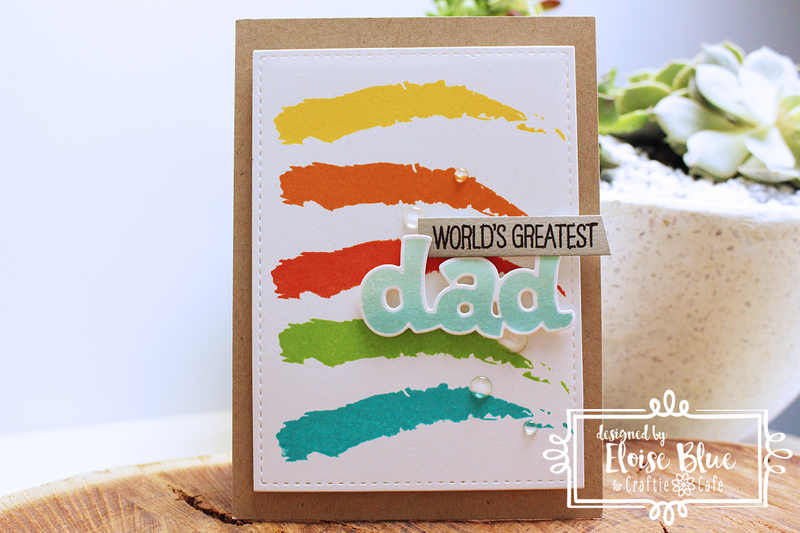 I took the swiped paint image from the Epic Dad stamp set and stamped it down my panel using my inks. I used Sunflower, Fake Tan, Pumpkin Spice, Freshly Cut Grass and Peacock for my five swipes. Once they were stamped I could stamp my sentiment. I used the solid ‘Dad’ image from the set, inked it up with Minty Fresh ink and stamped it down onto some more white cardstock. Then, since I wanted it to have a little extra to it – I decided it to look two-toned. So I took the Mermaid ink, inked up the ‘Dad’ word once again, used a cloth to pat off some of the ink at the top of the image and then lined up the stamp over the previously stamped ‘Dad’ and stamped it down, this gives a gradient effect to the stamp and it looks so cool! This would be easier in a MISTI or other stamp positioning tool, but I just used an acrylic block and it worked fine. Next up I needed to die cut the ‘Dad’ word. So first off I used the die to cut a scrap piece of cardstock. Then I took the negative piece of that paper, lined it up over the ‘Dad’ word and taped it down into place. Since the die is solid and you can’t see through it, this helped me now line up the die in the correct place. I then slid the die into place, taped it down and ran it through my big shot machine. Now it was cut perfectly. I then added foam tape to the back of the ‘Dad’ word and adhered it onto my panel. Next up I stamped the ‘World’s Greatest’ sentiment from the Epic Dad set in Black Liquorice ink from Lawn Fawn also onto a grey strip of cardstock that I ink blended a little Hippo ink onto the bottom of. I cut the side at an angle and adhered it down onto the top of the ‘Dad’ sentiment. To finish up my card I adhered my panel onto some Kraft cardstock with fun foam and added some clear enamel dots around the sentiment. Thanks so much for stopping by today and I hope you enjoyed this card. It’s such a simple design that can be used for so many different occasions with using different sentiments and colour combos.